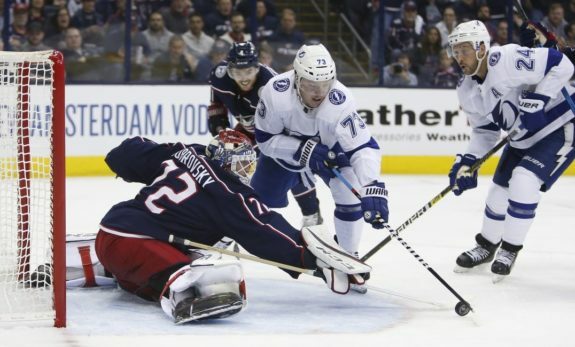 COLUMBUS, Ohio — The Columbus Blue Jackets extended their stunning post-season mastery of the Tampa Bay Lightning, beating the NHL’s best team 3-1 on Sunday night and moving to within a game of sweeping the playoff series. The night was satisfying for Bobrovsky — he hasn’t been great in the playoffs the last two seasons — and the Blue Jackets, who were 2-8 at Nationwide Arena in three previous post-season appearances. They are the only NHL team that hasn’t won a playoff series. NOTES: Kucherov was suspended for boarding Blue Jackets defenceman Markus Nutivaara in Game 2 on Friday. … Columbus signed D Vladislav Gavrikov on Saturday but he’s not cleared to play yet because his visa is pending. … The Lightning’s three shots in the first period were the fewest allowed in a period by the Blue Jackets in a home playoff game. … The Blue Jackets last won a home playoff game on April 18, 2017. … Columbus has scored four power-play goals in the series. We'll drop our latest Blue Jackets articles in your Inbox a few times a week.